Updated 4-20-16. When it comes to understanding how to perform a proper notarization, most Notaries are left to their own devices. Even states that have mandatory education requirements for commission applicants focus more on Notary law than Notary practice. Almost every state requires the signer to personally appear before you during the notarization. That’s crucial because it helps protect your signer, your employer, anyone relying on the notarization and you against potential fraud and liability. Personal appearance allows you to complete other steps in a proper notarization. Virginia and Montana permit Notaries to perform notarizations using audio and video conferencing technology — via webcam. Arkansas allows a Notary to notarize a document when the signer is not present under certain, limited conditions. To look for certificate wording that will tell you what type of notarization to perform. To review the certificate wording to make sure it contains all the elements a Notary certificate should have and that it conforms to the requirements of your state. To check for blank spaces. Some states mandate there are no blanks on a document and other states just strongly recommend it. Blank documents can be altered later in an attempt to commit fraud. Be sure to enter the date the notarization took place in the certificate wording. To verify that the name on the ID supports the name in the document. Scanning the document does not mean reading it for its details. You should just glance over it sufficiently to get the information you need. Personal knowledge, which means that you personally know the signer. Identity documents, such as driver’s licenses, passports and other government-issued IDs. Credible identifying witnesses who know the signer and can vouch for his or her identity. California does not allow Notaries to rely on personal knowledge. Identifying the signer is always required when you are taking an acknowledgment of a signature and may be required when you perform a jurat, verification upon oath or affirmation or affidavit as well; it’s also recommended when you certify a copy. At this point, make sure your signer is acting of their free will and is aware of what’s going on. You can do this with small talk and basic questions. When it comes to a signer’s awareness, it’s recommended that you simply make a layperson’s judgment about the signer’s ability to understand what is happening. And then take the signer’s acknowledgment, witness the signature, and/or take the oath or affirmation as required by the notarial act. Most states either require or recommend Notaries maintain a record of all notarizations. A good journal entry contains details of the notarization that are helpful in case a document or notarization is called into question. 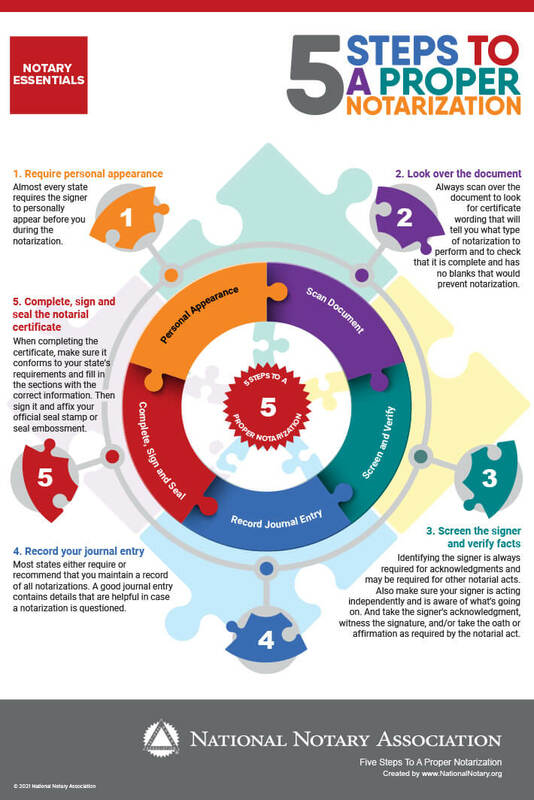 It’s generally a good idea to complete your journal entry before the notarization so you can make sure to collect all the necessary elements of the record, including your signer’s signature. If the document does not contain certificate wording, ask your signer what type of notarization is required and then attach a separate, or loose, certificate. Many signers do not know what type of notarization they need so you may describe the different types, but you may not make the decision for the signer unless you are a licensed attorney. If your signer is still uncertain, he or she should contact the issuing or receiving agency for instructions. When completing the certificate, make sure all the details are correct. For example, the venue — or location of the notarization, indicated by the words “State of … County of …” — should be where you performed the notarization, not where the document was prepared or will be filed. Finally, take care to sign and affix your seal properly. You should always sign exactly as your name appears on your commission. Your seal should be close to your signature but should not overlap any wording. The goal is to make everything legible. If you are in a state that does not require you to use a seal, you may need to add your name and commission information in other spaces below your signature. Many signers will ask you for advice or assistance regarding their document. Unless you are an attorney, you should always say no because it would be the unauthorized practice of law, and you could be held liable. You can learn about your state’s requirements for a notarization from your state’s Notary handbook, website or statutes, or the NNA’s Notary Primers or U.S. Notary Reference Manual, which is a member benefit. The NNA’s Notary Essentials eLearning course guides you through your state’s ID rules as well as identification best practices.